How would you like a blupdate ENTIRELY about food? Eh? Just for a change? Fantastic. With all the beer, music and film-loving that’s been going on here at RRR recently (that’s right, I nicknamed my blog. Whatcha gonna do? ), there hasn’t been an awful lot of time to sit back, relax, and think about food. That was partially out of design, as this was never intended to be a purely foodie blog anyway. Today, though, I had a meal I simply have to share. There is a chain of Italian-American restaurants in the UK called Frankie & Benny’s. They’ve gone down the retro route (a bit like the OK Diner) with style, playing classic rock’n’roll, jazz and 60s pop, while serving up American fare with Italian roots. Mostly burgers, pizzas and pastas. You usually find a F&B’s near cinema multiplexes, and there is one underneath our local Odeon in Maidstone, Kent. I went to go and see Avengers Assemble yesterday, and went with a friend to eat there afterwards. Everything on the menu looks good, so it’s quite hard for something to grab your attention. Then you look at the calzone section and… Chicken Carbonara Calzone. Sounds amazing, right? Well, it was. As my lunch companion was telling me, a real Italian carbonara shouldn’t be creamy at all, it should be made with egg and cling to the pasta, but this was certainly a creamy pizza. Plenty of pancetta, lots of chicken, cheese and other goodies besides. The taste was exactly would you would expect, and who doesn’t love a good carbonara? Add that to a pizza and you have an argument for Biggest Win in Food Since Cinnamon Waffles. If you live in the UK and you haven’t been to a F&B’s for a while, or have never been, take a trip down there. 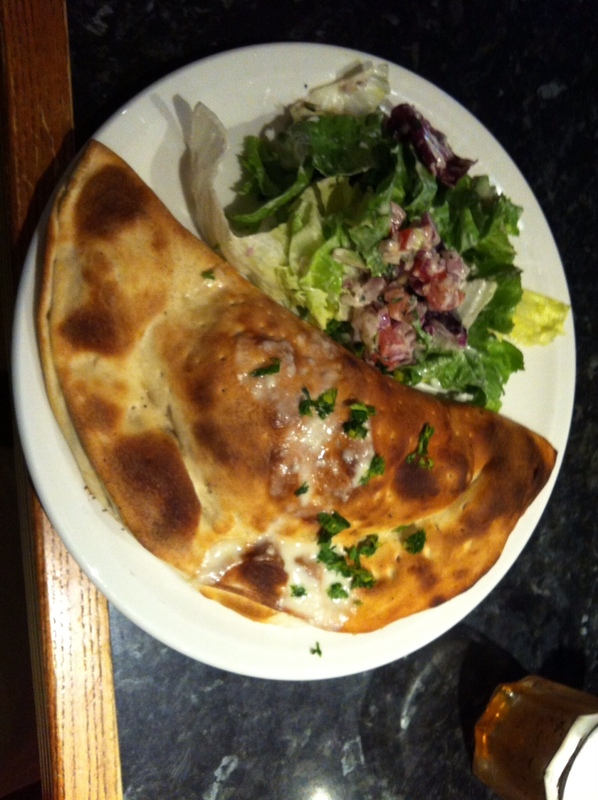 When it’s busy the atmosphere is great, what with the fantastic music and all, and this calzone is heaven on a plate. I even ate the salad! Frankie & Benny’s website is here.